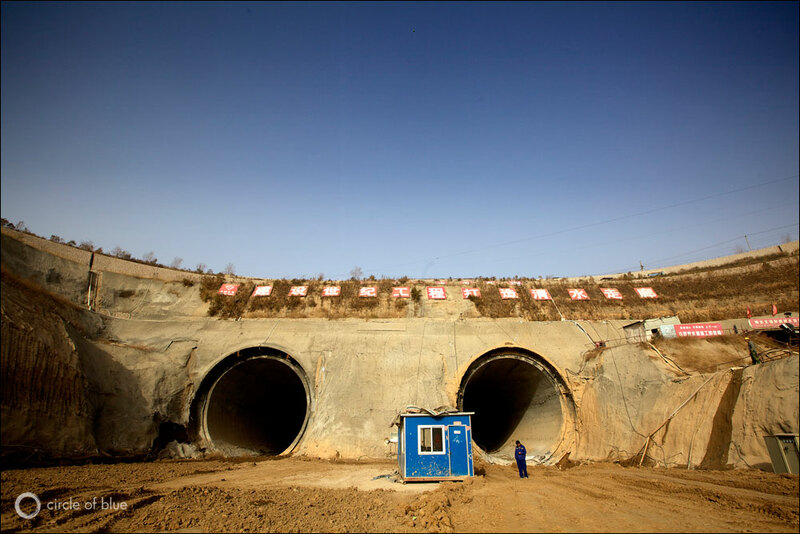 The dark openings of two pipelines beneath the Yellow River in Henan Province, like eyes on a flat face of dirt and rock, are unblinking witnesses to the South-North Water Transfer Project. China has completed a critically important tunnel beneath the Yellow River for the construction of the eastern line of the giant South-North Water Transfer Project, which will supply thirsty cities and industries in the country’s north, Xinhua reported. Dubbed the “throat” of the eastern route, the 585-meter-long, 9-meter-wide (2,000-feet-long, 30-feet-wide) tunnel will help transfer 14.8 billion cubic meters (3.9 trillion gallons) of water a year from the Yangtze River Basin to the parched northern provinces of Shandong and Hebei, as well as to the Tianjin Municipality by 2013. The $US 97 million tunnel is the latest chapter in this landmark national infrastructure project — known as the South-North Water Transfer Project — which plans to eventually divert 44.8 billion cubic meters (11.8 trillion gallons) of water annually from the Yangtze through eastern, central, and western routes to relieve acute water shortages in northern China by 2050. The water scheme was first conceived by former Chinese leader Mao Zedong in 1952 and was finally approved by the country’s Cabinet in December 2002, after debates that lasted nearly half a century. The mega-project, with an estimated total cost of $US 62 billion, has generated a strong current of public concern over land use, water pricing, possible regional climate changes, environmental damage, impact on agriculture, and massive human relocations. As Circle of Blue reported in depth in 2011, taken together, the three lines are an audacious strategy to solve a commanding threat to China’s modernization: the increasingly dire confrontation between rising energy demand in a nation that is steadily getting drier. Though China’s government authorities insist the project is essential to developing the cities and energy-rich provinces of northern and western China, critics argue that the magnitude and cost of building and operating the continental water-transport system would produce a cascade of unintended consequences that could overwhelm the benefits. Check out Circle of Blue reporter Aaron Jaffe’s photos of the project’s construction. Canal bringing water to Beijing is almost finished.